Yet Another Barbed 3-Pronged Hook Incident. Date: 17th January, 2012. Location: Monnow Bridge, Monmouth. Received two calls Tuesday afternoon about this 11.8 kg cob which was in very serious difficulty. He had been rescued from the river and taken to Monnow Bridge Veterinary Practice, where, quite rightly the view was taken dealing with what was obviously a very serious case of an encounter with lost or discarded fishing tackle. Coming from the birds beak was a short length of heavy duty fishing line attached to which was what turned out to be a small fish tightly bound to a triple pronged barbed hook with light weight monofilament. The line could be felt some way down the birds neck, but was obviously held fast by something. Compaction of small dead fish bound to triple hook by mono-filament line. It was one of those situations when there was no need for any discussion as to what the correct course of action should be; to the National Swan Sanctuary at Shepperton – IMMEDIATELY. As always, we phoned ahead advising an eta of about 1815 hours, which was more or less what we achieved. Within minutes of our arrival, an X-Ray examination confirmed the presence of a second triple pronged barbed hook some way down the oesophagus. Triple pronged hook in neck of monmouth male swan. 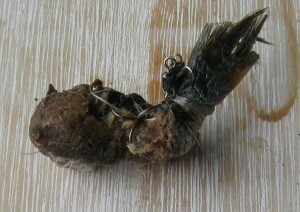 On the strength of this, the in-house vet was called immediately, and preparations were made to operate to remove this hook as soon as possible. In the meantime, large doses of antibiotics and pain relief were administered. It is no exaggeration to say within minutes of this, it was obvious he was starting to feel better as he attempted to ‘chat’ to another very sick bird in the adjacent cell in the intensive care unit. The operation was long and difficult, but, ultimately successful, ending at about 2200 hrs.Inevitably there was collateral damage to the wall of the oesophagus as it passed through to the point where it finally rested – it was this which contributed to the operation being a lengthy one. What remains, assuming things continue to go well is the prospect of a 2 – 3 week recuperation period. This bird has a mate, and they are a breeding pair, loved and admired by those who use the Monnow Bridge in Monmouth. The start of the breeding season is not all that far distant. Who could have done this awful thing …? But, as has been said so many times before, we doubt they care anyway. While this is being typed on 14th June, it actually relates to the follow-up to this story which occurred on 23rd. February when it was clear it was time to return the swan to South Wales; we left Shepperton at 12.50 pm, arriving in Monmouth some three hours later, only to be faced with the worst possible nightmare – a pair of swans was occupying our ‘friend’s’ territory. No doubt there will be those who will criticise us, but be in no doubt we sought to do only what was best for the swan – find somewhere safe to release him, and not immediately precipitate a king sized territorial dispute. As a result, we spent the next two hours, probably covering the best part of another 100 miles before we finally got home ourselves looking for, assessing and finally deciding what was the right thing to do. So, we checked the River Wye at Monmouth, Symonds Yat and Ross-on-Wye, and decided in all cases it was far too risky, What we needed was to be able to release the swan into a ‘flock situation’; this would enable him to sort himself out, and, we suppose, make the final decision to stay, or move on himself. Thus it was that we ended up finally at Cosmeston Lakes Country Park …. Exhausted, or what …? 7 Responses to Yet Another Barbed 3-Pronged Hook Incident. Really impressed with the post Peter! And fitting it in “around the Swans” as well! 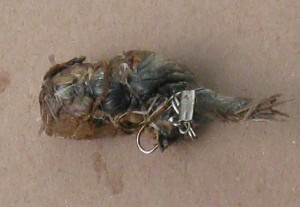 No-none at Monnow Bridge vets could have dealt with this, in your ‘highly qualified’ opinion? really???? Its not a complicated procedure surely? The vets there are fully qualified and very caring, at what they do. London is a long way to go for a bird that could have been treated competently and quickly and released on home ground. Whats your problem with them? Because of your interference we have lost a pair of beautiful swans…….thanks………….for nothing…………..
Not sure what kayle’s veterinary or other qualifications are, and I’m not even sure that he or she has managed to get this comment in the correct area. I’ll leave Peter and Ellen to respond in their own time, but I will make my own comments regarding the article and kayle’s comment. As I read it, the swan was already at Monnow Bridge Veterinary Practice where he had (presumably) been taken by someone else. This was on 17th January. I’m guessing that Peter and Ellen didn’t hold up the surgery at gunpoint when they took him to the National Swan Sanctuary at Shepperton, arriving at about 6:15pm. The swan was put into the Shepperton Intensive Care unit, assessed with the aid of X-Rays, and given pain killers and antibiotics. A lengthy surgical operation followed, ending at about 10pm. After this, if things went well, it was anticipated there would be a 2 to 3 week recuperation period before the swan would be fit to be released into the wild. Some FIVE weeks later, on 23rd February, the swan was considered fit for release, and that’s when the repatriation issue followed. And twelve months after that come kayle’s (IMHO) ill-informed and foolish remarks. I’m not sure how all of this works, as I’ve only been occasionally helping Peter and Ellen retrieve injured swans for twenty years or more. I’m guessing (hoping!) that Peter and Ellen don’t get charged vet fees when they take birds to any vets for treatment, although a bit of research shows that vets are under no obligation to provide free treatment, even for wildlife. I’m guessing that the National Swan Sanctuary (a charity themselves) don’t charge for their services, although I am sure a donation is always welcome. Helping swans is what they have set themselves up for, rather than a profitable veterinary business. I wonder how much Monnow Bridge Vets would charge for two hours of specialist veterinary surgical time and five weeks recuperation. Last time I looked, a ten minute vaccination for my cat cost me £35! Even with an absolutely incredible discount I think the bill would be expensive. I wonder how much kayle would be prepared to contribute to such a bill for the swan’s treatment? My guess is that without the National Swan Sanctuary and Swan Rescue, the swan would have been “put to sleep for it’s own good” before the day was out. And then you would REALLY have lost the swan. Had the RSPCA been involved, I doubt that the swan would have made it to the vets. (At Ellen’s insistence I once banged on the RSPCA ACO’s van to get an injured swan back, and the ACO was within five seconds of administering a lethal injection). Kayle’s comment is remarkably ill-informed; she writes as if to suggest she has some personal connection with these birds – no!! they are wild birds which, from time to time – and in our experience, all too frequently, have the misfortune to run foul of man and his pastimes. So, for the record, albeit over a year ago now (it’s a good job I keep a diary), here’s how it really was. We had been called to Bryn Bach Country Park to deal with another swan with fishing line around its legs, when, in the space of a very short space of time we had two calls about the Monmouth swan. Of greater significance was the second of these from an RSPCA inspector asking for help and calling from the vet’s surgery. Consider this; taking the shank of the hook as the centre of a circle, the diameter of said circle, taking in all three barbed prongs of the hook was about 20 mm. This was lodged in the proventriculus – the channel leading to the gizzard. 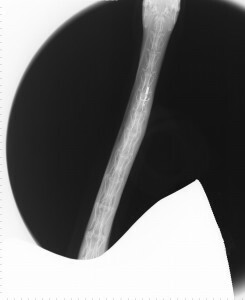 This much had been revealed by the X-ray examination. The good vet had absolutely no qualms about admitting dealing with this problem was outwith his experience – dealing with it using an endoscope was not an option, and he was so relieved to be able to accept our offer to transfer the swan to the National Swan Sanctuary, where dealing with such problems is almost, sadly, second nature; apart from anything else, there is the paramount need to avoid rupturing the carotid artery and the jugular vein; it is a lot of operating time under a general anaesthetic, followed by lengthy after care and rehabilitation. All this was provided at no cost to anyone other than those, who, in total provided the service. The Monmouth vet was pleased to be kept informed of the progress made by this very badly injured casualty of man’s carelessness. So, please no more of this silly, ill-informed and misguided nonsense; try again when you’ve in excess of 35 years experience of dealing with these problems year in and year out. thank you so much for your reply. If you had fully explained that on your blog originally things would have been more clear, obviously I have not had 35 years experience rescuing beautiful swans but us ‘mere mortals’ are left confused by what you do – are we not allowed to ask – for eg ‘Steve’ has a go at what this vet charges for cats, now I think if you love your cat, as I do, 35 quid is well spent and I think this particular vets is really good Mr Visram is an excellent vet who should be able charge whatever he thinks is right to keep cats safe. What does that have to do with swans? Having slagged off a wonderful vet he then goes on to have a go at the rspca. Now you, on the other hand say the rspca called you – why is your man having a go at them saying they would kill it when you obviously work with them? Clearly they did not kill it but called you in order to save it. Please understand me now, I’m not critising you personally, I’m just asking you about this discrepancy, if I dont ask or you dont explain then how can I know how this all works? Your man Steve seems to think I would be unwilling to pay for an injured animal. This is also not the case- I see these lovely swans every day on the Monnow why woudlnt I want to help them if they needed help? Of course we are protective of them. I can read what you put on your blog but if you would explain in more detail, what you do and your reason for doing it, because we the public dont honestly know, Im not ‘silly’ or ‘ill informed’ – I only know what you choose to tell me, please look at what you post as if you are a member of the public and see how it reads, does it make sense to those who are not not in the know, does it make sense to us ordinary folk? Do you see what I mean? – then it would be easier for people like me to support people like you and what you do – dont you think? It’s good to know that Kayle is a real person, and not just an internet troll stirring things up. And by extension, that he/she (sorry, not sure, although I guess “she”) is genuine about caring for the swans (rather than just “having a go”. My comment about my cat’s vaccination bill was just to explain that a visit to MY VET (not based in Monnow) is not cheap! And that if there were a bill for the treatment AND rehabilitation, then I think it would be very expensive. And as it turns out, the RSPCA were involved with this one – and called Ellen and Peter. I stand by my opinion that if Swan Rescue South Wales were not there to take the swan to Shepperton, that it might well have been euthanased. And this by a huge charity with paid vets and Animal Collection Officers (ACO’s) rather than a tiny group of unpaid volunteers like Ellen and Peter. If Kayle has a problem understanding what we do and why we do it then a phone call to the number on our website would have been far better and far more courteous. We have enough to do without trying to explain the hows, whys and wherefores every time we decide to write about our rescue experiences without having to worry about whether what we write is going to upset some member of the public. Just two points – Steve did NOT slag off the vet Mr Visram, and we do NOT work with the rspca in fact, we are quite independant of them and that’s how we want it to stay. All our casualties are taken to the National Swan Sanctuary in Shepperton, Surrey where they have a fantastic swan vet and where the birds will be allowed the best chance of recovery. Unlike the rspca whose policy is a bird with either a broken wing or leg must be euthanased immediately even without first being checked by a vet. This incident was a ‘one off’ call because the Inspector involved knew the swan had the best chance of surviving with us than with the organisation she worked for. And to finish – your criticism of Steve is ignorant and absolutely unfounded. He is an invaluable member of our small and over worked group and we would have difficulty managing without him. You know nothing about him or us so just in case you get an urge to write such rubbish again then check your facts first and don’t wait nearly twelve months before doing it.